I got some Justrite stamper stuff in the mail today. I got the wooden circle, a set of borders and centers, and the small letter set. Let me tell you, when they say small they mean teeny weeny small. It took me all of 30 seconds to lose one of the things and probably 30 minutes to find it. It was a miracle I found it at all. They are about 1mm x 2 mm (maybe a tiny bit bigger) and gray, so they blend nicely into any and all shadows. Plus I have this hi-low carpet in my scrap room and stuff really hides in that. So anyway by the time I found it I was completely out of the mood but I forged ahead. 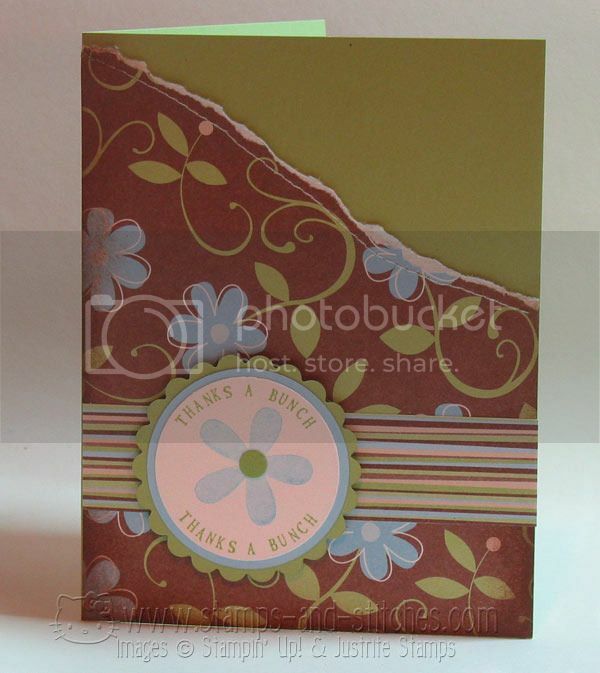 I made this simple card using a sketch from one of the Joy of Cardmaking magazines. After I had my patterned paper thing on the front all cut, torn and sewed, I noticed I had included the Stampin' Up logo on the corner. ARGH! So I got out my Close to Cocoa ink (which matches this paper) and my Tim Holtz foam inky thingy, and inked up the edges. I thought it covered it up rather nicely. The picture came out a little funky. My DSLR is acting up on me so I decided to try my old G2. Poor thing-it barely works anymore. edit-now that I look at it more closely, I think I put the S on upside down-on both places! Yay! Congratulations Erin! 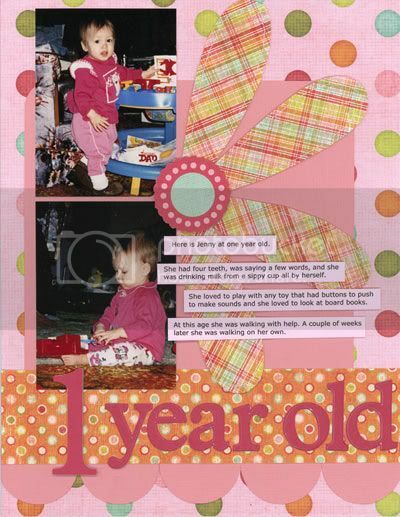 I wanted to wait until she got her pkg to post this topper that I made. I put the topper on the bag very crookedly. Once it was stapled on I wasn't going to mess with it but I didn't think she'd mind. So Erin, send me your address and I'll get your goodies sent right away!! I don't know about other people but I had never heard of having cheese with apples. Maybe I'm sheltered. Anyway my husband loves this apple crisp with cheese recipe that I got from his mom. It's easy too. Preheat oven to 350°. Peel apples and cut into slices (I peel first, then cut into quarters, cut out the core, and then slice across each wedge into about 1/8" thick slices). Put them in a baking dish-I use an 11 x 7 dish but I have also used a 9 x 9 dish. The apples should come about 1/2 to 2/3 of the way up the dish. Sprinkle apple slices with cinnamon and mix them around to coat them all. Add the water but don't pour it right over the apples or all the cinnamon will come off. I carefully pour the water in between the apples. Set aside. In a medium size bowl, mix the flour and sugar. Cut in the butter until the mixture resembles coarse crumbs. Add the cut up velveeta and toss to coat. Sprinkle evenly over the apples in the pan. Bake about 50-60 minutes. note: Cheddar cheese can be used for this recipe but I have found that it gets hard and chewy. For the velveeta, I use lo fat and also, I slice off about 1/4" slices and then cut them up into about 1/2" squares. You have to separate them with your fingers to put them in the dry mixture and it will be messy but it's worth it. If you buy the pre-grated velveeta that's even easier. I haven't tried it yet. These pictures were taken about 3 yrs ago at the Indianapolis Zoo. I could not find any info on this little guy but he sure was a cutie. Cardstock is Bazzill, patterned paper is KI Memories. The giraffe and the letters were cut from the cricut Zooballoo cartridge (the tail on the g is hard to see in the scan-it's easier in real life). Ribbon is from American Crafts, felt flowers from Stampin Up and brads from Bazzill. This is a sketch challenge from the design team blog at A Walk Down Memory Lane. Click on the picture to see it bigger (it is hard to post layouts here-I don't want to post great big files because I know some are on dialup).